I did something today I thought I’d never do. I bought a bigger backpack! Now before you get too excited, my new backpack is only 44L, and still fits well within carry-on guidelines. I just couldn’t do more than one season in my little 34L pack! And really, who can live with one pack when there are so many options out there! I’ve now designated my old Kyte-36 as the “one season pack”, and my new Kyte-46 as the “multi-season pack”. As I started packing for our trip to Africa (hot!) followed by Europe (in December = cold!) I realized I just needed a little bit more space. My first thought was to get a bigger purse, but then I’d have to carry around a bigger purse EVERY day. I decided I’d rather have a bigger pack than a bigger purse. It’s amazing how much difference 10L can make! Between my pack and Randy’s (his is 48L) we’re able to carry small boots for the girls, our stuffable winter jackets, mitts and toques, our clothes, toiletries, laundry stuff, most of our electronics and I still have plenty of room to spare. I could’ve done it in the Kyte-36 however there was no extra space and I’m sure I’ll want room to buy a souvenir or two along the way! I think I’ve somewhat perfected what we’ll need for this trip…I’ve been obsessing over it for months! I thought I’d share my carry-on only packing list for multi-season travel, including lots of great travel gear. If you don’t think you can do it all in carry-on only, check out Patti’s post about what to pack in a carry-on bag for a long flight (if you’re checking luggage that is!). It’s doable, I promise, it just takes a bit of practice and some ruthless packing decisions! So what’s in our packs? Everything in our packs…and I mean EVERYTHING, is packed into it’s own packing cube. I’d be lost without these things. We each have our own colour, and it makes packing and unpacking so much easier. I think I might have overdone it with the clothes a little bit, I even took out a few things after I saw what Randy packed. He totally shamed me!! Usually I’m the light packer but I keep getting carried away for this trip. I also stuck to the no-black or dark-blue rule to avoid getting bit by a Tse Tse fly, and tried to have a few more subdued pieces for when we’re on safari so I don’t scare away the animals! Randy completely out-did me packing this time. He chose not to stick to the no-black rule, so we’ll see if he gets bit by a Tse Tse fly or not!! All his shirts are Ice Breakers, so hopefully he won’t get too stinky!! Read More: My Favourite Filter Water Bottles for Travel, plus the rest of our water bottle system! It seems like a lot of stuff, but it all fits easily into our packs. I’m sure it’s not all necessary, but a lot of it’s nice to have if needed. I think our family doctor thought we were a little crazy when we went in asking for multiple antibiotics, however I want to ensure we’re all covered for things like traveller’s diarrhea, a urinary tract infection, etc. I’d much rather have it with us and not need it then have to go searching for it if we do. We also probably don’t need the parachute silk blanket, but it’s great for the beach or a picnic, and can be used as a blanket. Since it has multiple purposes I’m okay bringing it along. 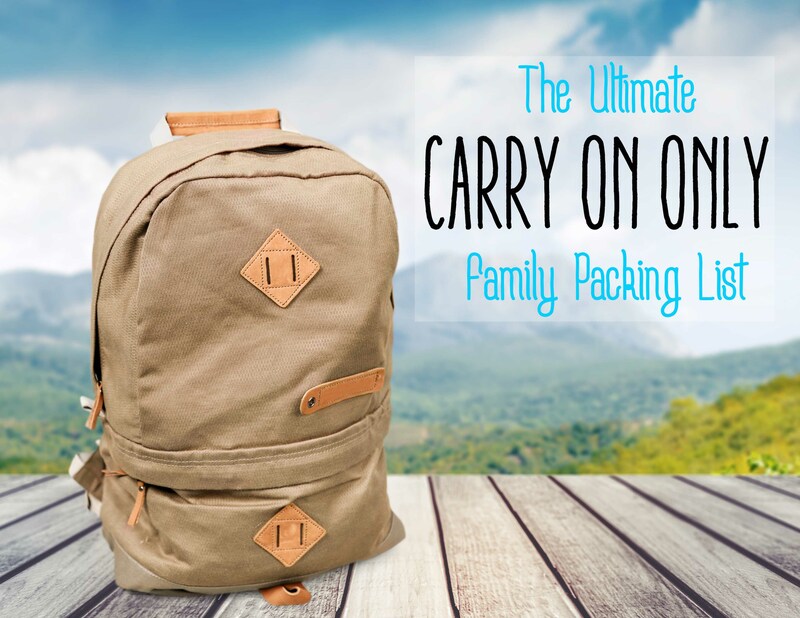 It might be breaking the rules a bit for packing light for a family vacation, but if we don’t use it on this trip it might not make the cut next time! There’s still plenty of space in my bag and a little bit in Randy’s. Now I just have to make sure we don’t fill it up before we go! Wondering what’s going in the kid’s packs? Read about it HERE!! Pin this for when you need it for your next big adventure!